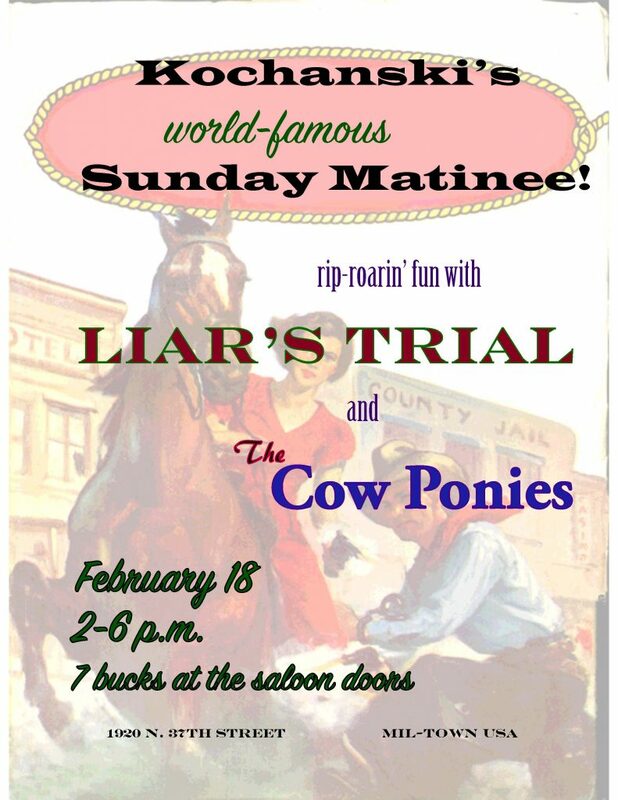 The Cow Ponies and Liar’s Trial, two Milwaukee alternative country bands, are back together again, playing at Kochanski’s Concertina Beer Hall’s Sunday Matinee. We met each other the summer of 2016 at Linneman’s when we were part of the lineup for the Gram Parsons 70th Birthday Bash that was making its way around the U.S. and Europe. The Cow Ponies, led by John Graham, and Liar’s Trial, led by Bryan Kroes, teamed up to play Kochanski’s Sunday Matinee a year ago in 2017, and man, did we have a blast! Up for a redux? We thought so! Only 7 bucks at the door. Bring a few extra clams and get you the new Cow Ponies CD, “Easy to Fall,” released a couple-a months ago on Dec. 2. Hope 2 C U!